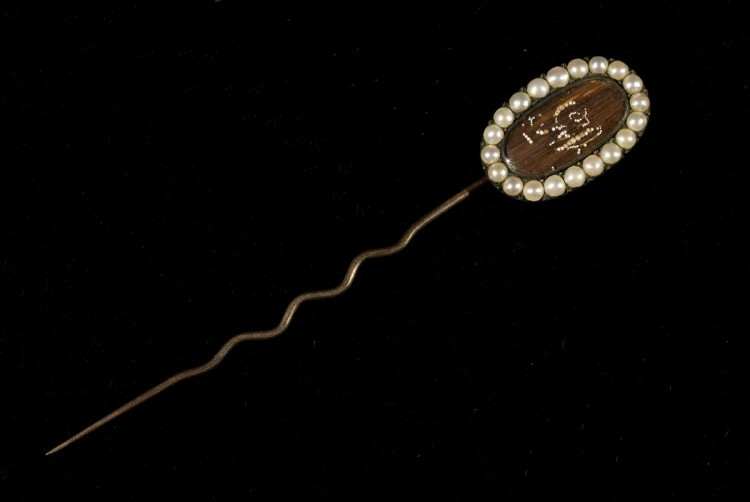 The oval bezel of this small stickpin holds a clipping of George Washington’s hair. In 1778, Washington gave a lock of his hair as a remembrance to his friends, John and Sarah Jay, as they were leaving America for Spain, where John Jay was to serve as U.S. Minister Plenipotentiary. Years later, in 1794, Sarah Jay gave the lock of Washington’s hair to her son Peter Augustus, who was accompanying his father to England for the negotiation of the Jay Treaty. Peter Augustus, at his mother’s request, took the lock of hair to a London jeweler and had it set under glass in this stickpin.